Rim 8 party glasses by dipping them in melted white chocolate. Dip the backside of individual Lucky Charms™ marshmallows into the white chocolate, pressing them around the rim of each glass. Set aside and allow chocolate to cool and harden. In a large punch bowl, mix together the sports drink and lemonade mix. Add ice. Serve in rimmed glasses. Enjoy! Any green drink will work so feel free to substitute green Hawaiian Punch™, Tropical Gatorade™, or kiwi soda for the melon sports drink in this recipe. 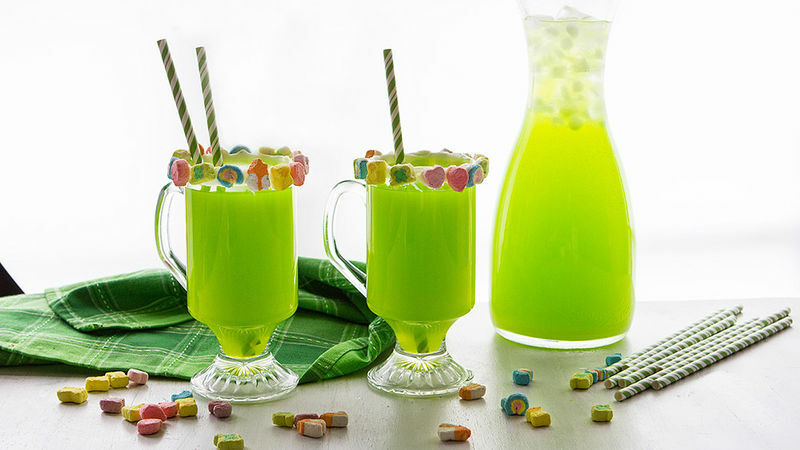 It doesn't get cooler than this easy punch served in glasses with Lucky Charms™ rimmers! Throwing a St. Patty’s Day party this year, and want to make sure your non-imbibing leprechauns also have something to drink? We’ve pulled together this easy non-alcoholic (and kid-friendly) Lucky Punch! It's the perfect party punch for anyone who wants to drink festively, without gettin’ boozy. The best part? You won’t believe how simple this two-ingredient punch is. Served in extra-fun glasses rimmed with Lucky Charms™ marshmallow bits, this isn’t just the greenest punch around – it’s also the easiest! Here’s your basic lineup: Lucky Charms™, melon-flavored sports drink, lemonade and straws. You’ll also need some melted white chocolate for dippin’ and rimmin’. I like melted my chocolate on a medium-sized plate. The flat surface is perfect for pressing glass rims into. Now the fun part. You know how you’ve always wanted to open a box of Lucky Charms™ and eat only the marshmallow charms? Yep. Now’s your chance. Sort out two cups of marshmallows. Save the cereal and make crispy bars for later. Or don’t. Today, it’s all about the marshmallows. Once you’ve dipped the rim of your party cups into the white chocolate, press the back of several marshmallow charms into the white chocolate and affix them around your cup. You’ll get a gorgeous set of punch cups that look like this. Now, all you gotta do is mix the sports drink and lemonade powder. Toss bunches of ice into your bowl, aaaaand….let the shamrock party begin! This mocktail is fun for everyone to enjoy.